Chez Canaille is a bistrot, pure and simple. That means copious portions, a menu that is meat-centric, heavy on charcuterie and doesnt stray far from traditional and regional specialties and a wine list of well priced bottles from lesser known appellations. In other words, no modern monkey business. Well, maybe a little modern monkey business. Like the fact that the menu lists the provenience of pretty much every entrecote, pied de cochon, jambon, boudin and andouillette(and sole!) they serve as well as good number of the vegetables, fruits and cheeses. Or that the wine list is heavy on wines that are organic or natural or both. Or that the person who designed the decor harbors a tongue in cheek romance for the look of old time bistros that borders on the ironic. Favorite dishes include textbook plate of beef marrow bones finished with a drizzle of persillade (two bones, each 10″ long…the waiter actually asked “Vous avez tout fini? C’est pas possible!”). Or a 4-bone côte de porc roasted for two and served with garlic roasted in its skin, thick cut frites and an accompanying saladier of curly endive dressed with grain mustard vinaigrette (although I think that when there are 4 bones, it is officially no longer a chop but has become a rack…this one from a porc noir de Bigorre, the black pigs whose legs are famous as the source of some of the best hams in the world). Or a choux a la crème the size of a soft ball, filled with crème chantilly and drizzled with caramel. Like I said, a bistrot. Le Garde Robe calls itself at “cave a manger”, making the point that it is first and foremost a “cave” or wine shop. And as a wine shop its offering of organic (or “bio”) and natural wines is impressive. However, there is a lot more Le Garde Robe than wine. During the course of the day, it is also a cafe, a wine bar and a petit restaurant, which is where the “manger” or “to eat” comes in. The kitchen is tiny and the menu very limited. But everything is impeccably sourced, from local farms or artisans, organic and well prepared. Charcuterie, cheeses, a few salads, a plate of crudites (or raw vegetables) served with basil pistou, and tartines make up the bulk of the menu. A few daily specials make up the rest. The day we were last there, these included a butternut squash soup, house smoked and air cured beef, and a cocotte of boudin noir with apples. Quality ingredients, prepared without pretension, at a fair price. And at lunch, there is no corkage when you select a bottle from the wine shop. 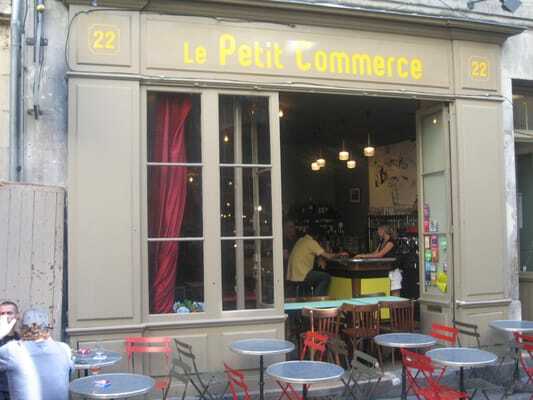 The Petit Commerce, a bistro specializing in seafood, reminds me of two points regarding the city of Bordeaux that are not necessarily the first that come to mind when I think of this capital of wine. First, Bordeaux is a port city and as such, has a rich culinary tradition surrounding fish and shellfish. Although officially located on the river Garonne, it is very near the river’s mouth and therefore close the rich fishing of the bay of Biscay. Bordeaux is also in the center of one of the most renowned oyster producing regions in France, very close to the famous oyster beds at Arcachon and around Oleron. Second, Bordeaux is close enough to both Spain and the Basque countries that its cooking reflects some of these regions culinary traditions. In this case, I am thinking of cooking on a “plancha” or flat topped grill. Its a very simple, rustic way of cooking that adds a rich, caramelized, note to any ingredient. And one finds it often in Bordeaux. Chez Mattin is a Basque bistrot in the fishing port of Ciboure, which lies across harbor from the larger coastal city of Saint-Jean-de-Luz. With its menu of traditional Basque specialties and its wood beamed dining room, Chez Mattin feels like a portal into a simpler time in dining. This is good, honest food, emphasizing both “la mer” and “la terre” with a daily chalkboard menu that features equally the products of the green hills of the Payes Basques and the best of the days catch from Ciboure, France’s second most important fishing port. The quality of the ingredients is irreproachable, the service is friendly (although don’t expect servers to speak English), the wine list full of well priced wines of the region. Chez Mattin was recommended to me by the owner of the well-known “La Tupina” restaurant in Bordeaux, who lives in Ciboure and commutes to work each day.